This is a great month in terms of catering to the taste buds and worst from view of health consciousness – and it’s not me to blame for any of the two. 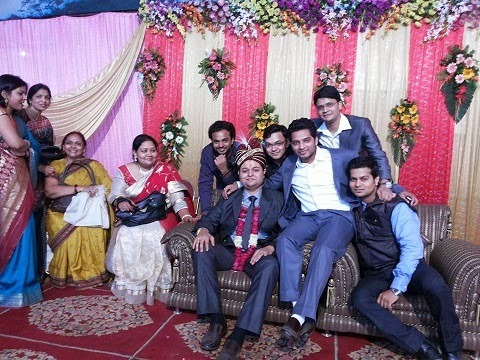 It is the marriage season for India and so I am attending such functions almost every weekend. While some of these are social obligations for being in the city with a lot of known ones, others are simply so special that you travel out of your city to attend them. This was one such trip which doubled up as an excursion around the Sangam City - Allahabad. Allahabad, previously known as Prayag, is a city of many talents. Apart from being of pivotal importance as a religious center, the city is home for many PMs of India and is center of political and judicial activism. Started from the familiar station of the New Delhi and boarded the Prayagraj Express to reach Allahabad, the next morning at 7. Since I did some schooling in the city, I was familiar with the neighborhood of the station and hence it was not difficult to reach the guest house booked for me. My first call was to one of my old friend whom I was meeting after a real long time. In the meantime I got ready and enjoyed aloo parathas from the guesthouse canteen. We started with hiring a cab for the day for which negotiations started at 1800 bucks for the day and finally settled at 600 Rupees for covering major attractions. We started with our first stop at the Yamuna Bridge, a new cable stayed bridge built in 2004. The requirement of the bridge was evident for long time because of old Naini Bridge catering to most of the traffic and hence was over pressured. This new bridge in longest cable stayed bridge in India and has gradually grown into a major link between Allahabad and neighborhood town of Naini. Next we moved to the point for which the city is known for – Triveni Sangam – the confluence of three holy rivers for Hindus and hence is considered as a sacred place for devotees. Here two rivers, Ganga and Yamuna are physically present while Saraswati is mystically invisible. A bath at the point of confluence is considered blissful for devotees and the place is also important for some other religious activities including immersion of ashes (including that of Mahatma Gandhi – Father of Nation). The bank of river Ganga here is also the venue of the famed Kumbh Mela held every 12 years and destination of over 100 million devotees. Near the site, we visited the temple of lord Hanuman known for the posture of the idol in sleeping form and known as – Lete Hue Hanuman Ji (lying down lord Hanuman)! If local stories are to be believed, every year the river (Ganga) raises its level to bath the idol of the god (Lord Hanuman). Around that place is another religious point called Shri Adi Shankar Mandir. Another religious point we covered was a Shaktipeeth and at this point we were tempted to title the city as one that of religious and spiritual importance. However, the city of Allahabad has much more to offer and is an important political and judicial center. This is the city of Prime Ministers and home of the first Prime Minister of India – Jawahar Lal Nehru. The city was center for a number of important political meetings during the freedom struggle. The next point we covered was another testimony of this. We reached Anand Bhawan and it was about lunch time by then. After a quick lunch in a neighborhood joint we bought the tickets to the place. Anand Bhawan was home of Gandhi - Nehru family and center of activities of the Congress Party immediately after independence. The home is now converted into a museum displaying various rooms used by Jawahat Lal Nehru, Moti Lal Nehru and Indira Gandhi along with original furniture and other items used by them. The house also preserves the guest room frequently used Mahatma Gandhi. These rooms also showcased the stark difference in life styles of the two great names in the freedom struggle. While the room of Nehru was full of royal leisure and all the luxuries of life, the one of Gandhi was a bare cot and a simple sheet spread over it. We also witnessed the show at the Jawahar Planetarium which showcased knowledge of stars and other celestial bodies. After this we visited the Chandra Shekar Azad Park which was the location where the great freedom fighter was shot. The last tourist location we covered was the Allahabad museum which displayed myriad of preserves from ancient time in the field of art, culture, architecture and politics. Old letters between political leaders and other sculptors’ preserves were on display. The 10 Rs entry ticket was definitely worth the display at the museum. We also passed through the Allahabad High Court on our way which is known for a number of high profile cases including one which set aside election of Indira Gandhi to Lok Sabha in 1975. We returned to the guest house after that and bid goodbyes. The primary reason for being in the city was that Manas, my best friend was getting hitched and so next on call was Anshul, Manas’s friend to plan for the evening. As planned, he picked me up and we met Ishan, Vibhas and others at the point of start of Baraat. After an hour of dancing – if we can call it one – followed by the Dulha on the car (yeah the typical ghodi was missed). After hogging on the good food on the stalls, it was time for var-mala ceremony where the groom and bride exchange garlands. Typically friends pick up the groom so that the bride has to put in extra effort, but in this case it was us who were subject to the effort – you need to have seen Manas to know what I mean. After witnessing one more friend travelling the inevitable lane of ghristha life, I wished him and bid good bye. 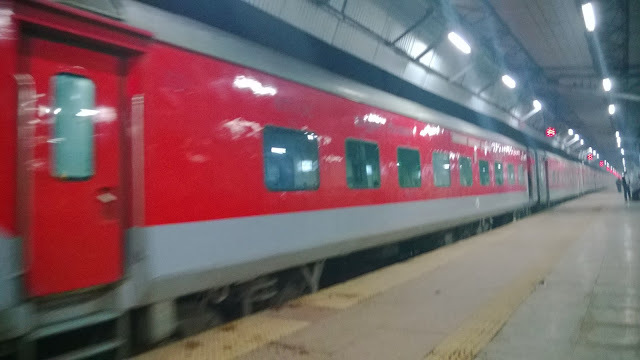 Later I boarded the Rajdhani Express back to Delhi. The last memorable event of the visit was the morning tea on the train where the typical dialect from Bihar - “chai lia jaye sarkar” reminded of the upcoming trip to Patna for another friend ready to jump the wagon!! Hey KT Nice Blog, It looks like a fun experience for you guys. I still remember my friend's wedding trip, they are always so memorable aren’t they. Your blog is interesting as well as informative. Great writing, so keep blogging and sharing.